The GoFormz scheduling engine lets you schedule a report to run periodically. Remember that GoFormz reports are dynamic — as more and more forms are completed, the data from those forms gets folded into the report if it meets the filter criteria you set for the report. For this reason, it often makes sense to run the same report periodically, to see what's changed. The report results can be automatically sent to you via email, or saved to a folder in your Box account. The report can be in PDF or CSV format. PDFs are best for presenting the report, whereas CSVs are best for analyzing the report data. 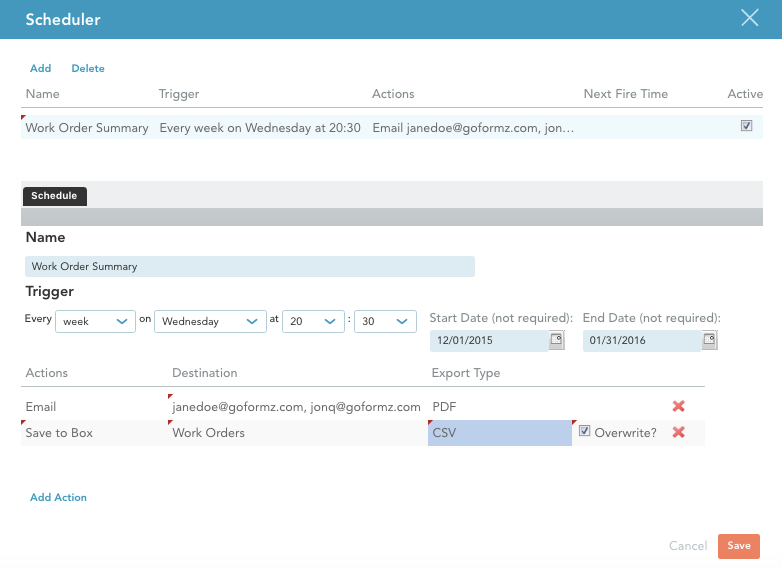 Here are the steps for creating a report generation schedule. Open the scheduler. 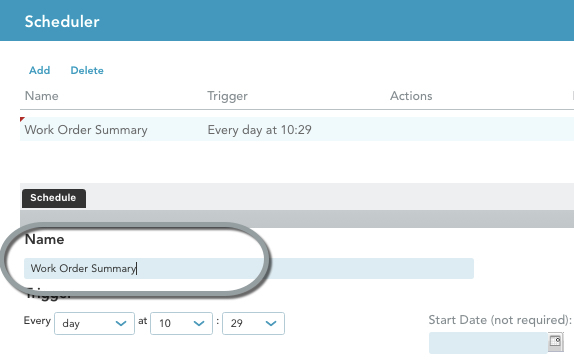 Navigate to the Reports Tab, expand the [...] Actions dropdown next to the report you wish to schedule, and select Scheduler. You must have an existing report in order to create a schedule; click here for more on creating a report. The Scheduler window will appear. This window lists all existing schedules for this report; if you do not have any schedules, it will appear empty, as below. 2. Add a new schedule. Click the Add button to set a schedule for this report. You will see the empty dialog start to populate, as shown below. A new row is created to represent the new schedule in the upper portion of the window, while details of the schedule are shown in the lower portion of the window. As you fill out the details at the bottom, they will immediately appear in the schedule summary row at the top. The next few steps guide you through filling out these details. 3. Name your schedule. Type a name for the schedule in the Name field. For this example we’ll enter “Work Order Summary”. 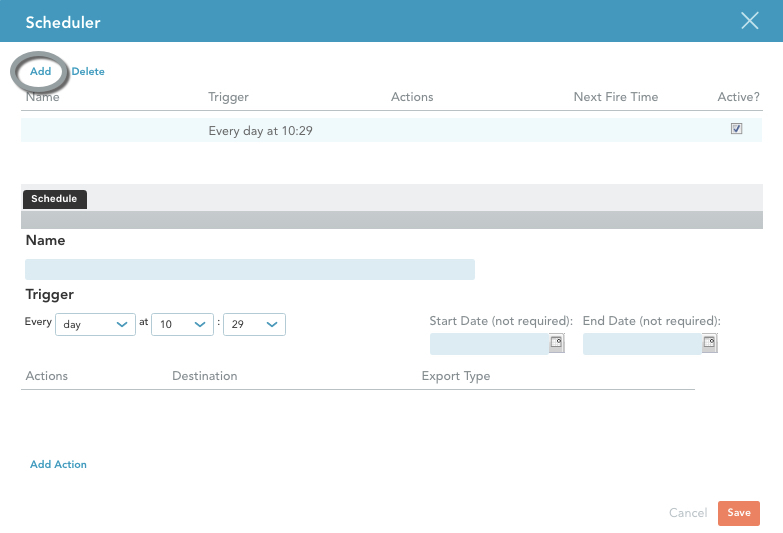 Cadence: You can set your report to run every hour, day, week, or month. Day/Time: You will be prompted to choose the exact time when the report should run. Depending on the cadence you selected, a different set of fields will appear, as follows. A) Hourly: Select the minute when the report should generate each hour. B) Daily: Select the hour and minute when the report should generate each day. C) Weekly: Select the day of the week, hour, and minute on which the report should run each week. D) Monthly: Select the day of the month, hour, and minute on which the report should run each month. Start Date (not required): If a start date is not chosen, the schedule will start immediately, in accordance with the cadence and day/time you entered. If you don’t want the schedule to start immediately, set this field to a future date. End Date (not required): The date when this schedule will stop. If an end date is not chosen, the schedule will continue indefinitely, until you stop it. In this example, we set the report to generate every Wednesday at 20:30 for two months — starting 12/1/2015, and ending 1/31/2016. Note that the time is expressed using a 24-hour clock — 20:30 is 8:30pm. 5. Add your actions. Now that we have configured when the report will run — let’s set the actions. Actions specify how the report is generated, and what happens to it after it’s generated. To do this, click the Add Action button at the bottom left of the dialog. There are two actions available at this time — Email and Save to Box. Email: This action instructs the GoFormz scheduler to send the report as an attachment to a specified email address (or addresses). In the Destination field, enter one or more email addresses separated by commas. Under Export Type, select the format of the report you want to send — PDF or CSV. 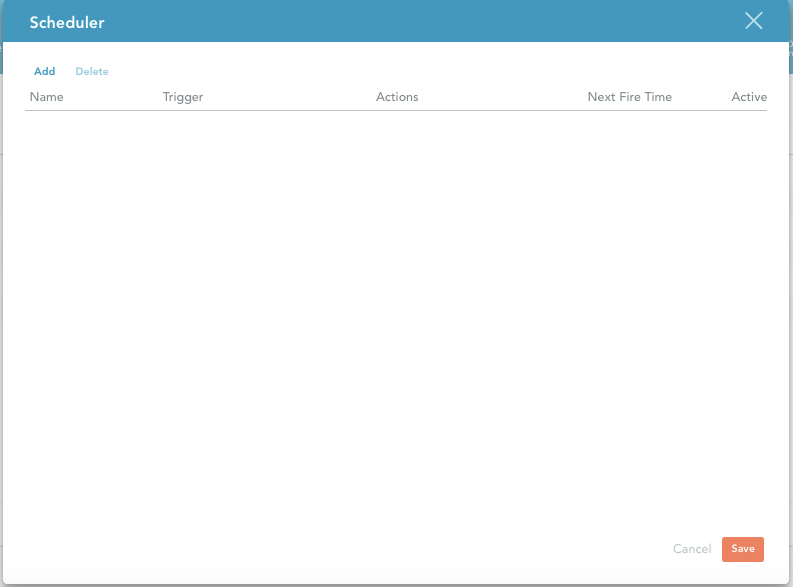 Save to Box: This action tells the scheduling engine to send the report to your Box account. Note that you must have your GoFormz-Box integration set up in order to use this option; See here for how to set up the Box integration. In the Destination field, select the name of the Box folder where this report should be saved. Under Export Type, select the format of the report you want to send — PDF or CSV. Finally, check the Overwrite? box if you want to overwrite the file that is saved, rather than saving a new file each time. This may be handy, for example, if you have a report that is accumulating data from more and more forms and you want a single growing CSV or PDF file, instead of multiple segmented files. Save a CSV report to the Box folder “Work Orders”, overwriting the existing report each time. 6. Review and save. Finally, review your schedule details and click the Save button in the lower right to save your schedule and dismiss the Scheduler dialog box. Note that you can add multiple schedules to the same report. For instance, you may want a weekly report as well as an end-of-month summary. Simply click the Add button to add another schedule for this report. Note also that there is an Active checkbox to the right of the schedule summary. This lets you suspend a scheduled event without deleting it. For instance, a report recipient may be going on vacation and does not want to accumulate reports in their email. In this scenario, simply uncheck the Active option for that schedule, and recheck it when they return.